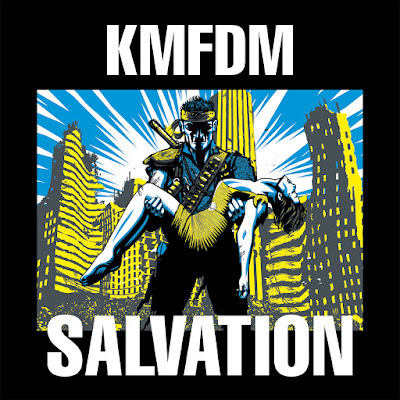 For over twenty years the acronym KMFDM has been indelibly written into the annals of industrial rock through a singular and dedicated level on conceptual continuity which most bands avoid. The band have stuck to their guns keeping the core of their ultra-heavy beat sound intact through musical fads, and forged an instantly recognisable image through their album art. The band's latest release 'Salvation' is an EP of reworked tracks from the recent the band's 2014 full-length album 'Our Time Will Come'. KMFDM remix albums and EPs are great for the simple fact that the band's dedication to certain musical motifs means that the main albums are guaranteed to deliver a certain style and calibre of output from the band. Whereas the remix albums play fast and loose with the band's sound and is a great chance to get some outside talent to drastically overhaul their originals. The EP opens with the anthemic title track which is as good an example of KMFDM's sound as you're going to get. The dance beats and hard guitar riffs power the track forward while the modern dance synths grab your attention, and Kapt'n K and Lucia's vocals entice you to sing-a-long with them. The first true remix of the EP sees tour mates Chant give 'Blood Vs Money' a wonderfully rhythmic reworking that draws heavily on old school industrial influences. Mindless Self Indulgence give the title track an upbeat and bouncy electro overhaul that completely eschews the hard guitars in favour of club-friendly ebm. Next up is 'Brainwashed' which sees Kapt'n K gives his work an new sheen with a more minimalistic electro-industrial presentation. Dope Stars Inc. up the heaviness once again with a remix of 'Salvation' in their own cyberpunk image of hard electronic beats, dirty punk guitars and jagged synths. The EP is rounded off with another remix of 'Blood Vs Money' this time courtesy of Tom Stanzel which introduces some glitch elements to the rhythmic assault. It would have been nice to hear a few of the other tracks on the album see the remix treatment, rather than stick to the same couple. But on the whole this is a nice EP that delivers where it needs to. Hardened fans and DJs will find this to be a must have, though new and casual listeners will find more meat on the source album. KMFDM could be a band that sits comfortably on their laurels based purely on their 90s output alone. But they don't, and their high-quality full-length studio albums and the left-field remix albums are more than enough to define their relevance today.